The road to happiness can sometimes be complicated by certain roadblocks that impede our ability to pursue our dreams, support our families, or dampen our image of ourselves. As part of the POPSUGAR Insights "Find Your Happy" study, we surveyed women to determine how happy they were in various areas of their lives and then looked at the bottom two box summary (somewhat unhappy and very unhappy) to rank in which areas of their lives women need the most help. Perhaps not surprisingly, a woman's biggest roadblock to happiness is her financial security. Nearly 35% of women said that finances is the aspect of her life where she is least happy. This was the leading cause of unhappiness across all age ranges, life stages, and ethnicities, especially among those who are not employed (38%). 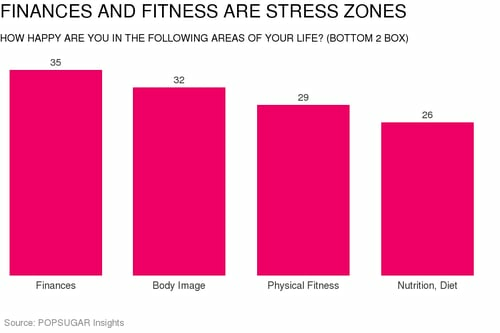 The next two leading roadblocks to a woman's happiness related to her body image (32%) and her physical fitness (29%). Among areas of a woman's life that ranked lowest in terms of happiness, additional topics related to her self-image, wellness, and overall health ranked highly including her nutrition (25%), her looks or appearance (23%), and overall health (16%). Other topics unrelated to body image can be seen as roadblocks to happiness. Twenty-five percent of women would love to travel more (25%) and have a better love life (20%) — including 28% of teen girls — as well as improve their home organization and design (18%) and their career (17%). Among topics that are least likely to contribute to a woman's unhappiness, the use of technology to improve her life ranks last, creating an opportunity for brands that have either developed technology to help women tackle their roadblocks or want to associate with lifestyle content that aims to help women become happier in terms of their finances or body image.